← Caption Contest 5 winner! I'm starting a new rule this week -- no more than three entries per person per contest. Middle Word Balloon:poor Clark here gave quite a tasty performance, but he's just been voted off. Put on those thinking caps and come up with your best funny line and you too could win your very own professional illustration! top word balloon:Ahhh, fresh Blood!just a minute isnt this bob the cleaner! 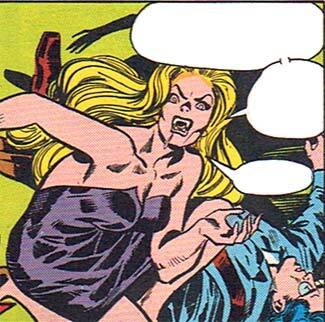 Middle word balloon:oh my god what have i done.Mr Draculas going to be so furious! Bottom word balloon:err im glad i had a old tradditional vampire affair with him,Mr Draculas crap! 1: The doctor said I had to get more fruits in my diet. 2: Now I eat adam’s apples and neck-tarines everyday! What officer? No no, he’s fine. All I did was smile and he passed right out.It’s kinda disturbing how often this happens, actually. 1: After a heavy meal of blood and flesh, my breath is a little less than fresh! 1. Shoot. Every time we look like getting to third base he passes out. 3. HEY CARLA! LARRY’S DONE IT AGAIN! GET THE CAR BATTERY, THE HAIR MOUSSE AND THE 9 IRON! First word balloon: Dang! Every time it’s the same darn thing. Tastes . . .
Second word balloon: Like . . .
B1: Come on already! Why can’t I get a break from you cops? B3: LINDSEY LOHAN ALREADY WENT TO REHAB!!!! 1. Have you ever tried overpowering a grown man in a strapless, backless, high cut dress? 2. Verachi evening wear protects your modesty against all probability. 1. I knew those kryptonite teeth implants would come in handy. 2: and you call me an inhuman monster. 1: I’m not a psychopath! I’m a vampire! balloon 1: I can’t freakin believe this! balloon 2: They put peanut butter in my chocolate! Third balloon: …so VOTE REPUBLICAN!! 1: What?! Are you seriously trying to tell me that I have to pay a 15% gratuity for him? 2: Your service was so slow, I couldn’t wait; he was supposed to be dessert! I want to speak to a manager! 1..this is a job I can really sink my teeth into..